Knitting with wire is a lot of fun, but some tips from someone who's tried it before can be helpful before you go on your own wire knitting adventures. The first thing you should know about knitting with wire is that wire is a lot less fluid than yarn. That seems pretty obvious, but it means that your stitches will look pretty much exactly how you formed them unless you pull and stretch the "fabric" to even the stitches out. You probably won't get a perfectly uniform wire knit object until you've had a good bit of practice, but giving the work a tug every few rows will help even things out tremendously. Before you get to that, however, just grab some needles and some wire, cast on a few stitches and practice knitting with wire before you try starting a project. First, in order to knit with wire, you'll need wire, of course. Wire comes in many different thicknesses (known as gauge, which has nothing to do with gauge as we know it). The larger the number, the thinner the wire. For knitting, the best gauges are in the range of 24 to 30. Much bigger and it's just too hard to work with, and the finer gauges are too delicate for this kind of work and, even if you can knit them successfully, will probably break the first time you try to wear them. I like using 28 gauge because it seems the easiest to work with for me, but you can experiment and find what you like. When you're first learning, just buy whatever you can find in the jewelry-making section of your local craft store that's in the right gauge. As you get better at it, you can invest in lovely (and more expensive) wires made of silver and gold. When it comes to knitting needles, everyone has an opinion. Some say metal needles are best when working with wire because they're unlikely to get scratched; others like wooden needles for the same reason. Again, try a couple different kinds of needles and see what you like (I'm in the wooden needle camp myself). 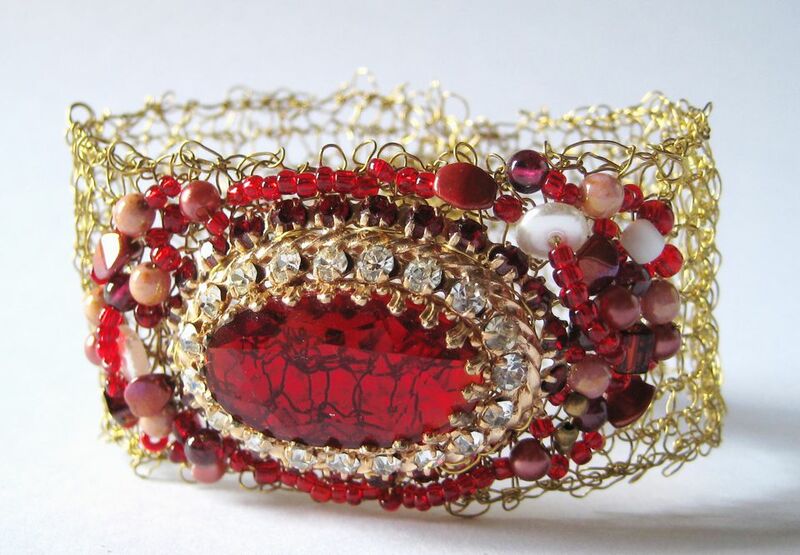 Most knit jewelry worked with wire also has beads incorporated into it. You can use any kinds of beads you like, so long as they'll fit on the wire you're using. To knit with beads in this way, string them on the wire before you cast on. Other tools you might find handy include wire cutters (or really strong scissors) and a collection of jewelry making pliers, but they are by no means critical, especially when starting out. The key when knitting with wire is to not overly stress the wire by twisting it into strange positions, as you would, for example, using a long tail cast on. The best method for casting on with wire is the wrap cast on. You can make basically any stitch that you could do with yarn using wire, but I like plain knitting (some people actually find purling with wire easier, so give both a try). You can perform increases and decreases as well, but a plain old yarn over (wire over?) might be the best method to increase, and the hole won't be so noticeable because there are holes throughout your "fabric." Add beads wherever you'd like by just pushing a bead up to the end of your working wire and holding it between two stitches. Remember that you can pull and stretch your work every few rows to "block" it to the shape you want and to bring more openness to the work if that's something you'd like. A normal bind off is possible when knitting with wire, but I prefer to just cut off a tail and weave the stitches through the wire one at a time, pulling just hard enough so the loops tighten up. This is the perfect method to use if you need to install a clasp on the piece you're working on, because you can incorporate it into the "bind off" when you get to the position where it needs to go. Any excess wire can be woven in gently as you would a yarn end, and then clipped with strong scissors or wire cutters. Another important thing to know about knitting with wire is that it's a lot less forgiving to your body than is working with yarn. You'll find your progress a lot slower than if you were working with yarn, and your hands will get tired more quickly, even if you don't normally have repetitive stress problems. So remember to take it slow, rest when you need to and have fun discovering how fun it is to knit with wire.